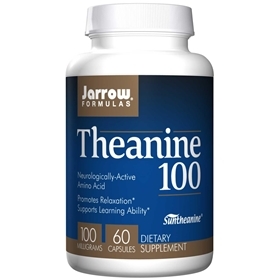 Theanine 100 is a unique amino acid found almost exclusively in green tea that exerts beneficial effects on brain metabolism. Theanine induces relaxation without causing drowsiness, as measured by increased generation of alpha-waves. Theanine may improve learning ability and sensations of pleasure by affecting dopamine and serotonin neurotransmitters in the brain. Also, Theanine exerts protective effects on the brain by antagonizing glutamate toxicity. Take 1 to 2 capsules per day with water or juice on an empty stomach, or as directed by your qualified health care consultant.